Acme CAD Converter is a power bacth DWG converter, it can convert DWG DXF and DWF files into PDF, BMP, GIF, JPEG, WMF, PCX, TIFF, PNG, TGA, DXF, DWG, SVG, SVGZ, CGM, EPS, HPGL(PLT,HGL) etc., and also supports the conversion between DWG and DXF file versions (AutoCAD R2.5-R2012). Supports replacing missing font file. 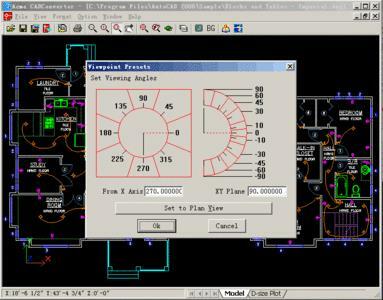 Supports bacth transmit command like AutoCAD,and batch recover drawing files. It can export layers information into the PDF file and it allows you export OLE entity and raster entity into PDF file, Supports 3D objects Hidden line removal. Supports user-defined Watermark.